In May of 2007 the Zylman Family lost their son Casey in Iraq, and as a result they wanted to do something to honor Caseys memory. Randy Zylman, his father, served with the 25th Infantry Division in Vietnam, and Casey also served with the 25th Infantry Division as a Calvary Scout during Operation Iraqi Freedom. 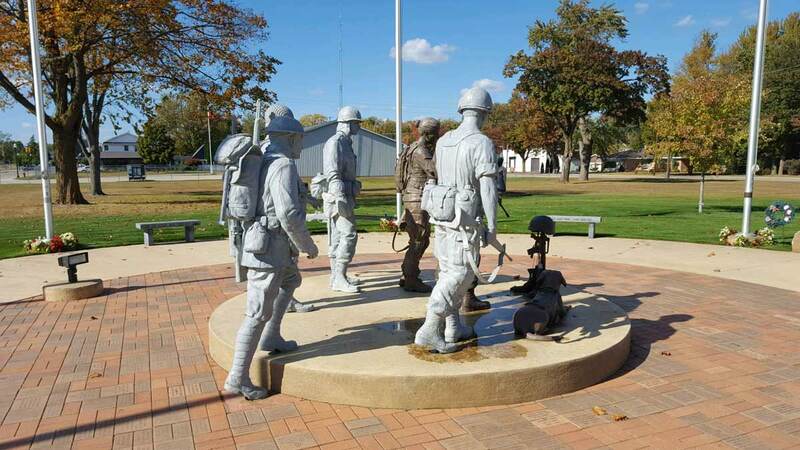 After much thought, they decided to honor the Coleman Community as well as all area Veterans with something bigger, and so the Coleman Veterans Memorial Committee was founded. There are 3 walkways leading into the center of the courtyard. They represent the service men and women who answered the call to duty, coming together from all directions and walks of life, each with their own personal reasons to serve our nation and become America's defenders. The outer circle represents how the individual services circle together to protect our country, how we are unified as one nation and as brothers and sisters. All five service flags representing the Army, Navy, Air Force, Marines and Coast Guard are on the perimeter of the circle..
"Bricks of Honor" make up the inner walkway. These personalized bricks honor those who served our nation. 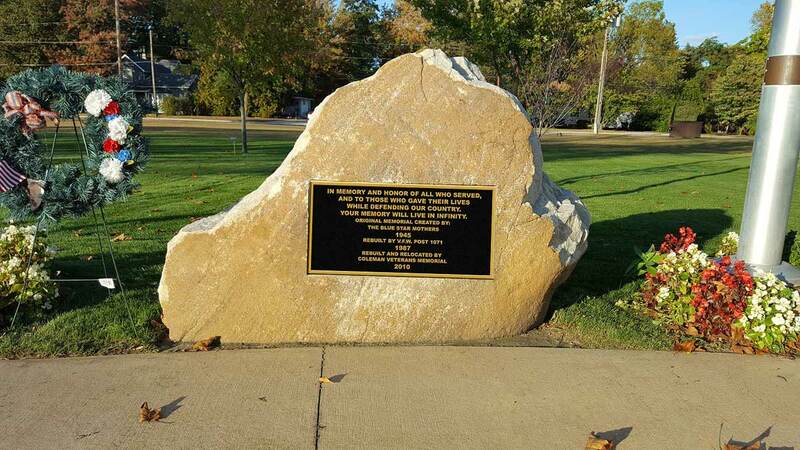 They represent the Coleman community, Midland County, Isabella County, and people all over our country who have purchased a brick to honor their loved one or friends who have served. 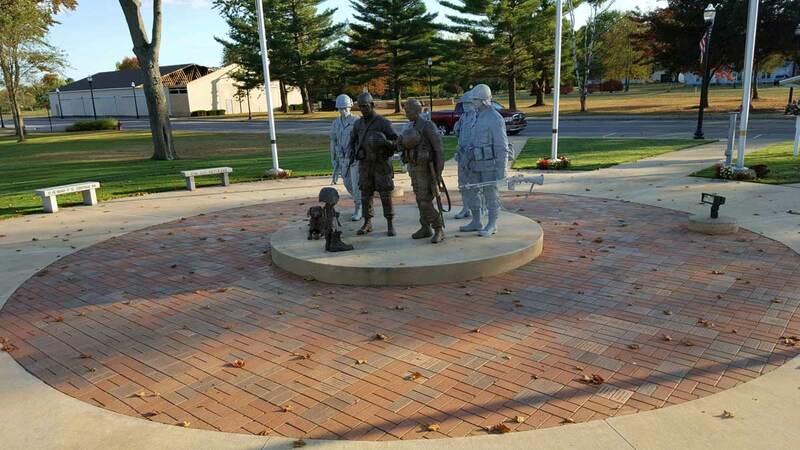 The center is where our memorial statues are placed. The Soldier’s Cross has been a symbol of a fallen comrade since we began defending our shores. The first soldier is a shade of brown, which depicts the living. He represents the Gulf War, Operation Iraqi Freedom, and Operation Enduring Freedom. This Soldier is walking into the courtyard to honor a fallen comrade. The second is that of a female combat soldier (First of its kind), and she is also a shade of brown. She also represents the Gulf War, Operation Iraqi Freedom, and Operation Enduring Freedom, while standing beside her brother to honor the fallen. 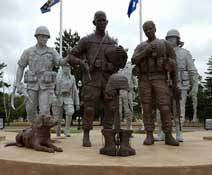 We've also placed a Military Working Dog to represent our Canine Soldiers who fight alongside our men and women and help protect us. The remaining statues are a shade of white. They represent the spirits of those who gave their lives in those wars. It also symbolizes how their motives were pure when they served. 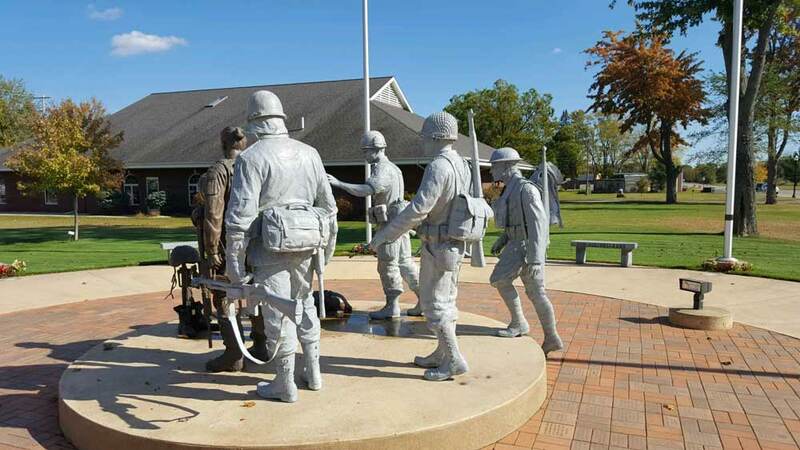 The third Soldiers Statue is from the Vietnam Era. His hand is reaching out to his battle buddy’s shoulder to offer strength. The fourth is from Korea, the fifth is from WWII, and the statue in the back coming in and stepping up to the center is from WWI. They are all filing into the courtyard to honor and console a brother. 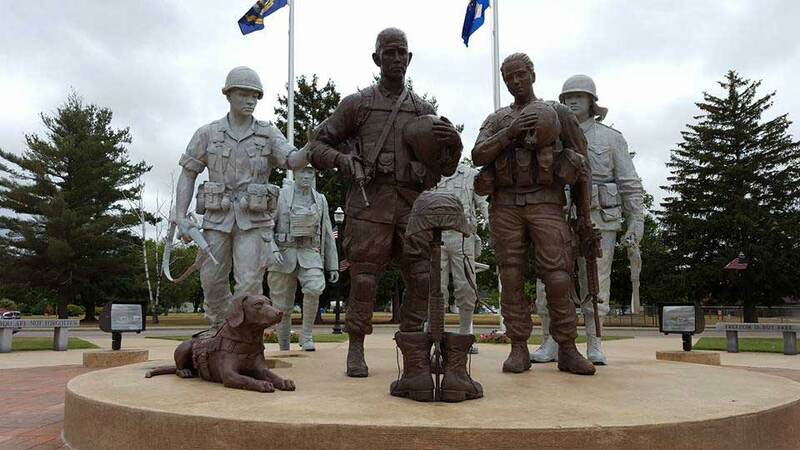 The Statues are facing away from you as you walk into this memorial so that when you visit our beautiful memorial, you will be walking into the courtyard along with the soldiers, taking in all the names of those who served and who paid the Ultimate Sacrifice, to pay tribute, show honor and reflect with them. 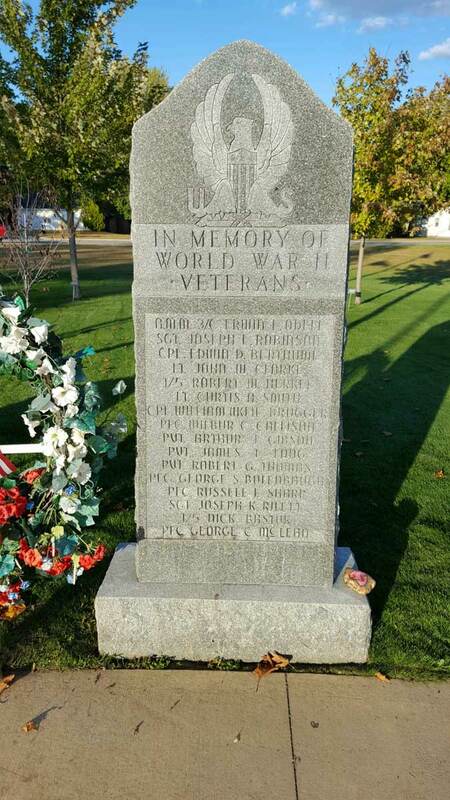 This memorial is an educational tool to show the cost that so many Veterans have paid to have a free nation. We came into service as individuals, we left as brothers and sisters, as a family, who fought and died for each other. Please come and visit our memorial! We would love for you to come help us educate the youth, while also being a part of something special to our community. Honoring those who've served, dedicated to those who've sacrificed! Download a form for mailing your donation.